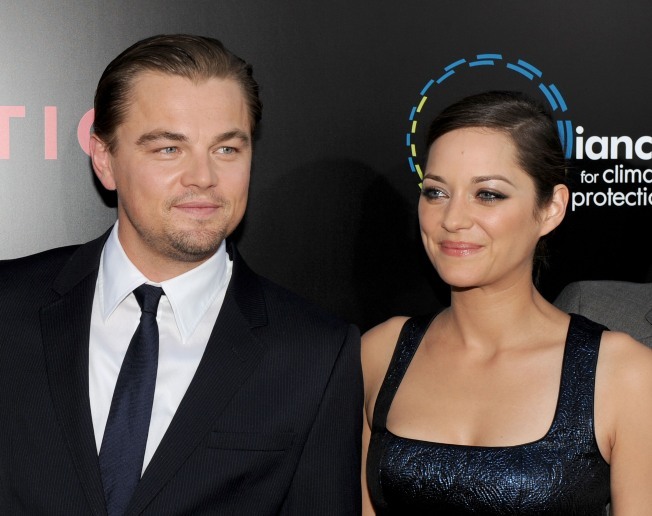 Actor Leonardo DiCaprio (L) and actress Marion Cotillard arrive to premiere of Warner Bros. "Inception" at Grauman's Chinese Theatre on July 13, 2010 in Los Angeles, California. "Inception" is many things – a heist film, a visual spectacle – but according to Leonardo DiCaprio, the Christopher Nolan-directed film is also a love story. "This is a love story in a lot of ways," he told Access Hollywood at the film's LA premiere on Tuesday. "It's a love story in different states of the human subconsciousness and different dimensions. "Marion Cotillard's character, Mal, and I… we've existed in parallel worlds and had a relationship," he further explained, without giving away too much. "I think that will suffice." The film may be mysterious, but Marion herself told Access that working alongside her handsome leading man didn't take a lot of thought. "It was one of the best experiences I've ever had and I mean it," she said. "I would love to work with him again." She also hinted at how her and Leo's characters connect. "Sharing dreams is something that was totally created out of Christopher Nolan's imagination," Marion said. "So we really had to create their past and to talk about this relationship and this very special thing they share." VIEW THE PHOTOS: Ooh La La! Fabulous Shots Of French Beauty Marion Cotillard! "Inception" arrives in theaters on Friday.